There may be less buyers out there shopping for a home during the winter months, but that does not mean it is impossible to sell your home during the holidays. Staging is a long used trick of real estate agents, flippers, investors, etc. to help sell homes. If you want to sell your home more quickly great staging has defiantly been proven to help. Buyers want to see themselves living in a home and staging helps them to see the potential of making a space great. Staging during the holidays by adding a few festive touches helps to sell the cozy and homey vibe of a property. Here are some tips for decorating your home without putting a ton of effort or money into it. Because let’s face it; less is more when selling a home and who wants to clean a bunch of decorations up and pack them when the home sells? This one may seem obvious and for those tree naturalists out there not frugal or easy. I am going to go out on a limb here (did you catch that tree pun) and tell you to invest in a fake tree even if its just a small one. Why? Because Christmas just doesn't feel like Christmas without the tree and a fake tree is very low maintenance. It doesn’t have to be a big high quality tree. You can get a perfectly respectable one on sale at Target, a craft store or some other box store. They are usually on sale for great prices at these stores before black Friday. With shabby chic and hipster influences being so popular you can easily decorate with rustic or homemade decorations you don't need to worry about being broken. Just stick to a simple color scheme to keep it chic. One of the biggest home sellers is curb appeal. Many people have done studies on the most effective ways to bring curb appeal to a home and the front door plays a huge role in the curb appeal of your home. Bring some holiday cheer to your front door with a wreath. It will make buyers want to take a look inside. There are many ways to construct a chic and inexpensive wreath, check out Pinterest for some inspiration. It can be something as simple as some evergreen branches in a circle with a ribbon. Simply adding some blankets and a few throw pillows in gold, green, red, and other holiday colors will go a long way to help your home feel cozy, homey, and festive. Purchase one pillow with a fun holiday saying that already matches your décor colors and place it on the couch or go all out and replace/recover all the pillows with some Christmas ones. You may already have a blanket in a holiday color around the home; pull it out and drape it across a chair or the arm of the sofa. Put décor in areas you really want buyers to notice. Do you have a cool reading nook or sitting area in the master bedroom? Highlight it with those Christmas throw pillows and blankets. Maybe you want to give attention to the fireplace in the main living room. Hang a wreath and place a few chic decorations or a garland on the mantle. This is a great and simple place to stage a festive scene. Roll out some burlap to use as a table runner and place some red candles along it with a few touches of evergreen branches and maybe a few pine cones. 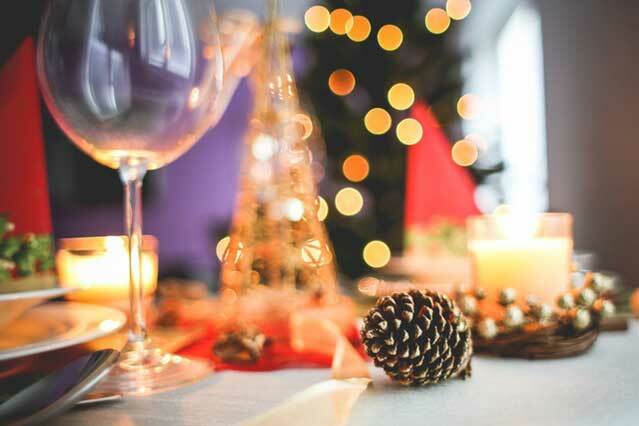 One of the best ways to get buyers excited about buying a new home for the holidays is imagining the gatherings they could host. Usually hosting a holiday gathering involves a meal. You can invoke a lot of warm cozy feelings here. Staging is a great way to make your home more interesting to prospective buyers. One thing you want to keep in mind is not to go overboard and bring in lots of clutter. Keep things simple and use a neutral color scheme with pops of one color. This will help you to pull off simple and chic and have buyers imagining themselves in a new home for the holidays. For more information on buying or selling a Louisville home. Please feel free to browse our website or contact us anytime.